DUBLIN (AFP) ― Ten years since setting a trend with its workplace smoking ban, Ireland is pushing ahead to be the first EU state with plain packaging for cigarettes despite fierce opposition from tobacco companies. As part of Dublin’s plan to make Ireland a smoke-free society by 2025 ― meaning a prevalence rate of under 5 percent ― lawmakers will vote to introduce plain packaging in the new year. Under the draft legislation before parliament, all forms of branding, including logos and colors, would be banned and all products would have a uniform packaging with graphic health warnings. “The cigarette box is the last form of advertising that the industry has,” James Reilly, Ireland’s minister for children who is spearheading the drive, told AFP. 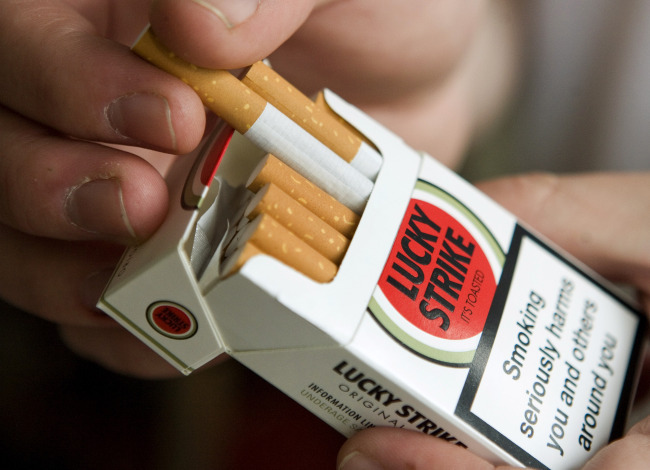 In March 2004, Ireland became the first country in the world to adopt a total workplace smoking ban. A decade on, Ireland is at the forefront for Europe, following Australia’s introduction of similar plain packaging legislation in 2012. Canberra’s move was met with fierce opposition by tobacco companies and other nations, particularly tobacco-producing economies. Five World Trade Organization members have initiated dispute proceedings against Australia’s measures at the WTO, arguing the laws are an illegal restriction on trade. As was the case in Australia, the tobacco companies are fighting Dublin’s plans. “No evidence has emerged from Australia, where plain packaging has been in place for almost two years, showing that plain packaging has changed the rate of decline in smoking or has had any actual positive behavioral impact at all,” Japan Tobacco International’s general manager in Ireland, Igor Dzaja, told AFP in an email interview. The tobacco companies say no concrete evidence exists to show the Australian ban was responsible for a reduction in smoking rates, despite Canberra stating daily smoking rates are down from 15.1 percent to 12.8 percent in three years. Pat Doorley, head of the Royal College of Physicians of Ireland Policy Group on Tobacco, said 50 studies show the measure will work. “The thrust of all these studies is that people prefer packages with the logos and the embossing and the colors to the plain packs,” he told AFP. Dublin is also looking to ban smoking in cars with children and to continue increasing the price of tobacco. In last month’s budget, 0.40 cents was added to the price of 20 cigarettes, bringing the cost to 10 euros for the first time. But Reilly is adamant Dublin will proceed with the plans, despite the opposition and possible legal challenges ahead. “I think it’s testimony to the fact that it’s going to work given the tobacco industry’s very strong reaction to this. Reilly said Ireland could hit its smoke-free target despite a current prevalence rate of 21.5 according to Ireland’s health service. “Absolutely. One should always aim as high as one can.